Myanmar (Burma) is known by some as “The Land of Festivals”. It boasts over forty festivals across the country through the year. Some are national events linked to Buddhism, others specific to a location or tribe. They all give an interesting glimpse into local traditions. 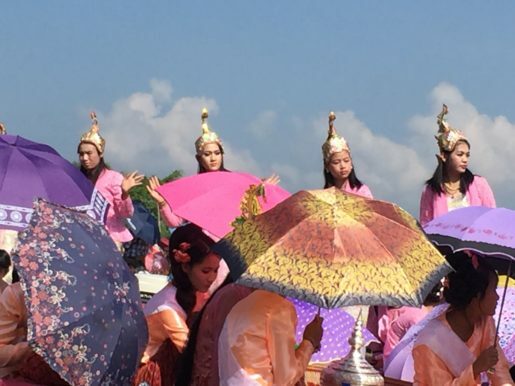 Our recent visit to Inle Lake, in Nyaungshwe of Taunggyi District of Shan State, coincided with the annual Phaung Daw Oo Pagoda Festival. 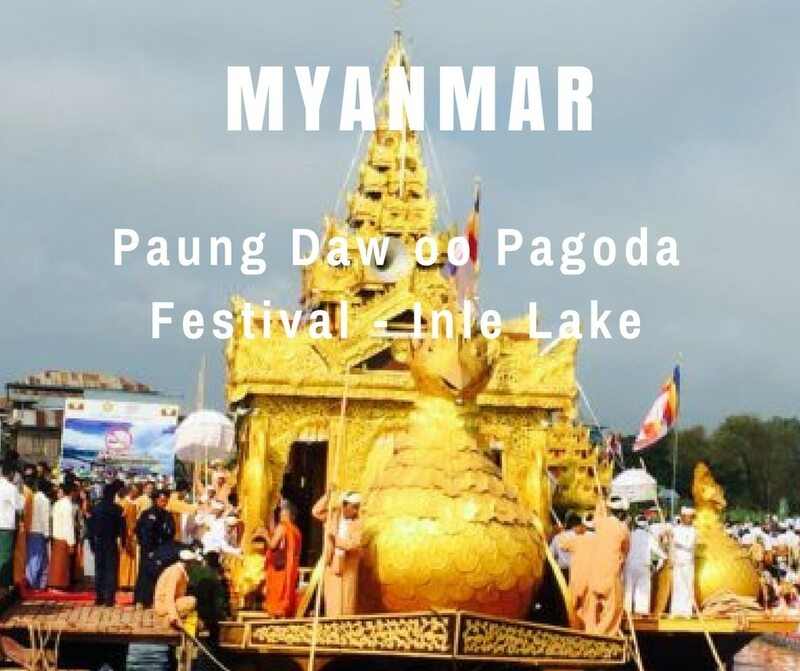 The Paung Daw Oo Pagoda Festival is Myanmar’s largest festival. It’s celebrated over 18 days in September and October each year. 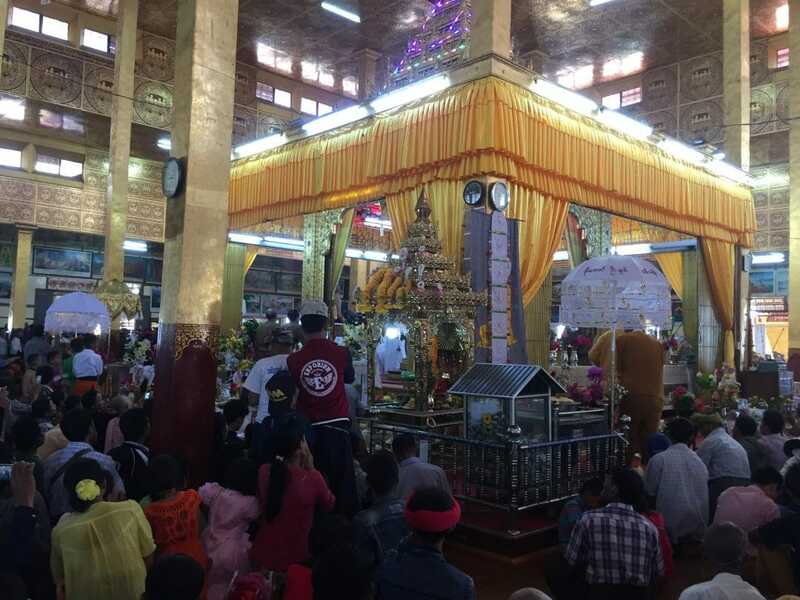 It starts on the first day of the waxing moon, continuing to the 3rd day after the full moon of Thadingyut (the 7th month of the Burmese calendar). Many of the diverse hill tribes gather at Inle to enjoy the festivities of this Buddhist festival and gain merit. Like all Inle Lake life, the festival centralises on the lake and in the lakeside villages. Paung Daw Oo Pagoda is the most famous pagoda of Inle Lake and houses five small sacred Buddha effigies. Once a year four of the effigies are transported around the lake on the Golden Royal Karaweik barge. The barge is towed around 14 villages on the lake by long canoes manned by Inle leg rowers, spending one or two nights in each village’s monastery. Only four of the effigies take part in the ceremony these days because once, the barge capsized, losing the fifth to the depth of the lake. It later re-appeared in the pagoda and has remained there ever since. During the festival, each village noisily greets the royal barge and celebrates every moment of its stay there. The canoes are paddled using the skillful, one-legged rowing technique in time to the drumming. 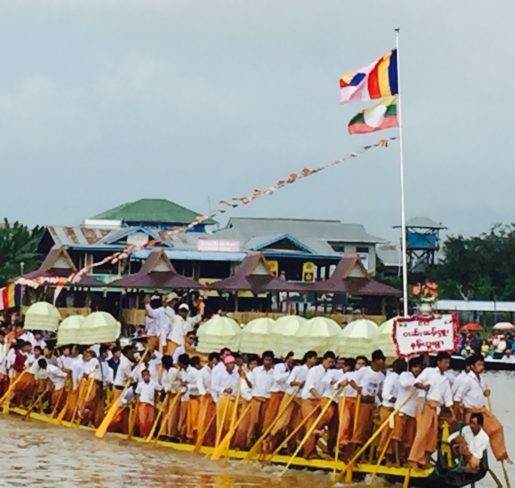 A few of the rowers showcase traditional Shan dancing and martial arts on a raised platform in the centre of the boats. Another highlight of the festival is boat races between teams representing the villages. To witness this festival you need to get out on the lake. 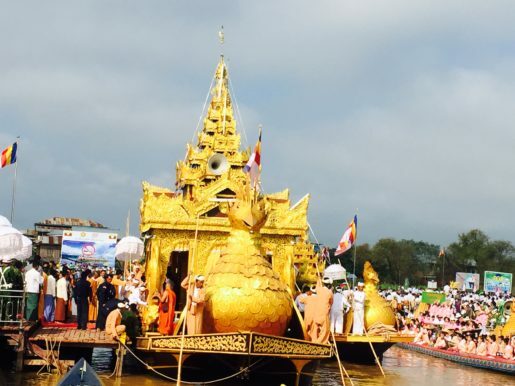 With the exception of if your visit falls on the 3 days the royal barge stops in the main town Nyaung Shwe). Knowing which village is hosting the barge each day and the timings is also a necessity. Inle Lake is 22km long, so unless you’re lucky you could miss the main event. 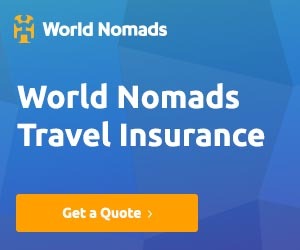 Most of the hotels, guesthouses and tour agencies in town should be able to help you with this though. I managed to find the entire schedule online here, which is great and is showing the 2017 itinerary already. A motorised canoe and boatman are needed to get out on Inle Lake. This can be arranged through your accommodation, a tour agency in town or with one of the boatmen who will approach you in town or around the main jetty. Be aware that on key days during the festival the price for a day canoe trip is hiked drastically. We ended up paying around 50,000 kyat (£31GBP), earlier on in the week it was only 30,000 kyat (£18GBP). Also, make sure that your boatman understands that you want to see the festival. If you’re not firm, he’ll take you round the sites, markets, handicraft stalls and workshops where he’ll receive a commission. These are interesting but you may miss the festivities, so best to do these on the way back or another day. Few of the boatmen speak any English at all so I think it’s worth paying a little extra to book through a tour agency. This ensures you’ll see and do exactly what you want to, to your own schedule. We took a boat trip on Inle Lake early on during our stay, in the hope of catching that day’s procession. The boat driver was asked to take us to Ma Kyee Sake, from where the royal barge would depart. Unfortunately, we’d not timed it quite right and were way too early to catch the procession. We briefly saw the barge and some of the food and drink stalls. Apart from that, it was mainly people waiting around for the procession to the next village to start. We wanted to see the rest of the sites of Inle Lake and so decided not to stay that day. Disappointed at not getting the full experience we gave it another go at the end of our stay. We chose the last day of the festival as it’s meant to be the most spectacular. It also features the biggest and best boat race of the festival. 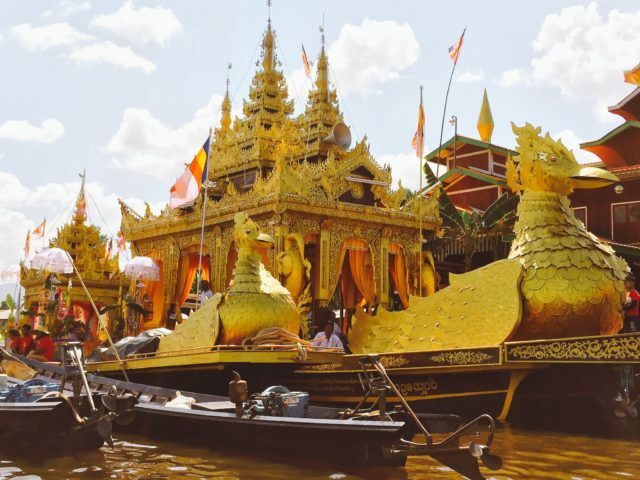 The Royal Karaweik barge was due to leave Ye Tha at 8 am, to be towed to the Paung Daw Oo Pagoda, the last stop of the festival. Once there the Buddha effigies would be returned to their rightful place. We weren’t sure when the actual boat race was going to be but had our fingers crossed we’d at least catch a glimpse of it. We got an early start at about 6:30 am in the hope we’d get to a good spot to watch the procession and the races. Typically the boatman decided to take us to some of his ‘mates’ workshops in the hope of some commission. We’d visited these on our first trip so quickly turned him back from the lotus weaving, silversmiths, and boat builders. These detours meant we were running late. 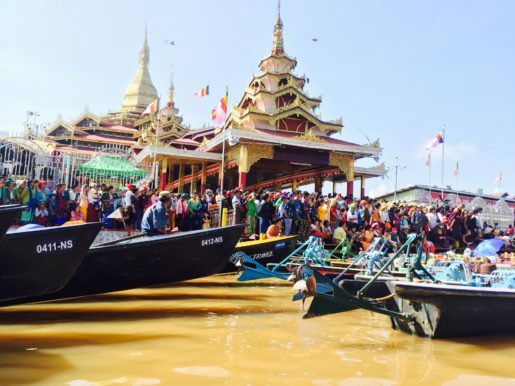 By the time we reached Paung Daw Oo Pagoda, the river was jam packed with canoes moored side by side. We couldn’t get closer by boat, so we pulled up, jumped onto to a wooden jetty and crossed a rickety wooden bridge towards the Pagoda. The canoes, jetties and river banks were full of monks, nuns, locals, visiting hill tribes and tourists. We pushed our way through the crowds around the pagoda to try and find a spot where we could see what was happening. It was chaotic, everyone pushing and shoving to try to get the best view. I’m amazed the jetties actually held the weight of everyone. I had visions of us all ending up in the muddy water. I managed to squeeze into a gap near the front and could see a small barge with female Shan dancers in traditional costumes. Loud tinny music blaring out from loudspeakers accompanied the dancers as the contenders of the boat race began to arrive. We weren’t in the right position to see the finish line, but the decorated canoes and costumed leg rowers did pass us as they lost momentum after the race. The excitement of the crowds was palpable as the music volume increased. Several smaller canoes circled in front of us signaling the royal barge was approaching. Each contained a seated Shan woman, again in traditional dress. Each one held a silver dish with some kind of offering…rice I think. The canoes next to us began to part to let several canoes towing the Royal Karaweik Barge pass. They were detached from the barge and it floated to a standstill at the entrance of the pagoda. At this point, we decided to escape the crowds and the deafening cacophony of music, drums, gongs and lively cheering, to head into the pagoda. The pagoda was surrounded by a large courtyard packed with market stalls. They sold everything you could imagine, food, drink, household goods, toiletries, toys, balloons, handicrafts and much, much more. People from the hill-tribes bustled about, each dressed in their own beautiful, colourful traditional outfits. Cooking smells and conversations wafted through the air, it was truly a feast for the senses. Many people started to head into the pagoda and we decided to join them. We left our flip flops looking woeful in a pile with hundred of others, doubtful if we’d ever find them again. There was hardly room to swing a cat inside the pagoda. Families sat huddled on the floors of the open corridor surrounding the central room. They appeared settled for the day with food, drink, and offerings such as flowers and rice for Buddha. The smell of burning incense filled the air. We made our way into the central room and this was equally as busy. Devotees prayed and made offerings as the four Buddhas were passed to waiting monks, to rejoin the fifth Buddha. We stayed just long enough to see a couple of the Buddhas arriving. It was then time to get the hell out of there before the mad rush to leave began. I was panicking a little that we were going to get crushed or pushed down the pagoda steps. To our surprise, our flipflops were exactly where we’d left them. Reunited with the smelly footwear, we made our way back to the boat. There are many accommodation options in and around Inle Lake to suit all budgets. The whole thing really was a sight to behold, an amazing experience, which we were lucky to have been a part of. 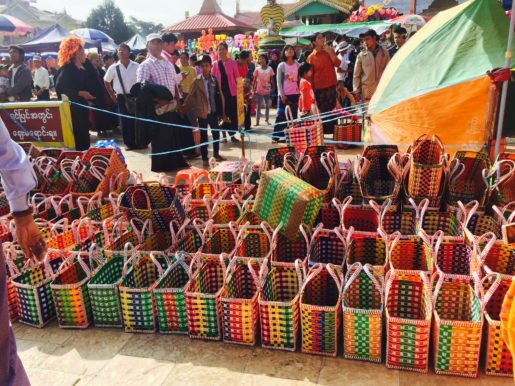 If you ever get the chance to visit Inle lake in October try and coincide it with this festival. 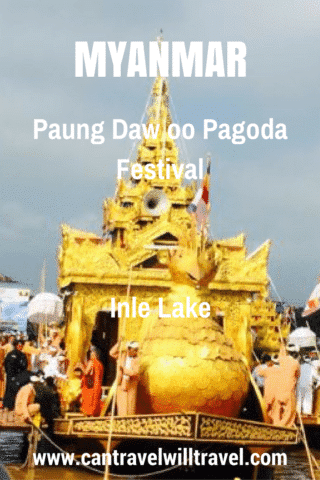 Have you been to the Paung Daw Oo Pagoda Festival and what did you think? Do you have any recommendations for other Myanmar festivals? Going next week and really enjoyed your story. Felt like I had already been. Beautiful narrative! Thankyou. That’s great you’re going – enjoy your time there!